Grandma came over to visit tonight and hang out with the girls and watch Frozen. It gave me some free time to draw and watch a movie on my own. I did a little drawing but was pretty entranced with my movie selection for the evening. 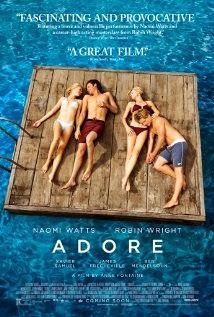 Adore is an indie film directed by Anne Fontaine and based on the novel by Doris Lessing. Two neighbor best friends, played by Robin Wright and Naomi Watts, live in remote location in Australia surrounded by stunning turquoise beaches. The women do most things in life together including having two sons who are the same age and are quite good friends as well. As the boys get older, they become attractive young men that the women describe in one scene as "like young gods." As the story unfolds, it becomes evident that the men have started to desire the other's mother and those feelings are reciprocated by the women. There is a taboo relationship that begins to form between the four as each woman has been a mother figure to the other's son and the age difference is at least twenty years between the men and women. The women, surrounded by the Utopian scenery, make smile lines and beach hair even seem attractive. The complex, provocative relationships and excellent acting had me completely wrapped up in the story; I never wanted it to end. There is also something about cinematography that use subdued colors with a breezy, soft linen feel that I just can't get enough of. The film isn't for everyone. I would recommend it to anyone who has enjoyed films such as Laurel Canyon, The Good Girl, or American Beauty.